Cracked Ink with one of his street art works. 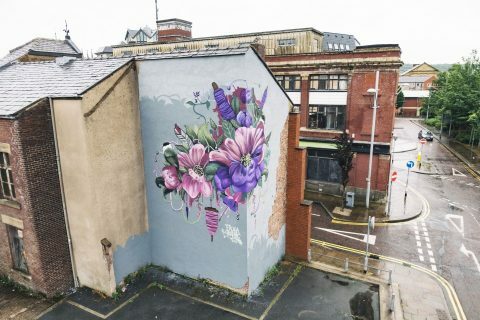 This week sees the start of Blackburn Open Walls, a street art festival that has invited artists from around the globe to descend on Blackburn to decorate its walls. 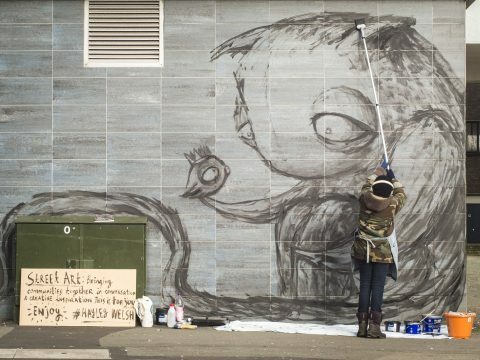 Organised by street artist Hayley Welsh, originally from the town but now living in Australia, and Blackburn based Alexandra Gallagher, it will see nine artists over five days turn the town into a giant canvas. Now in its second year, this year’s line-up includes Blackburn born Dale Grimshaw who is widely recognised for his strong political artworks famously depicting the threatened indigenous people of West Papua New Guinea. 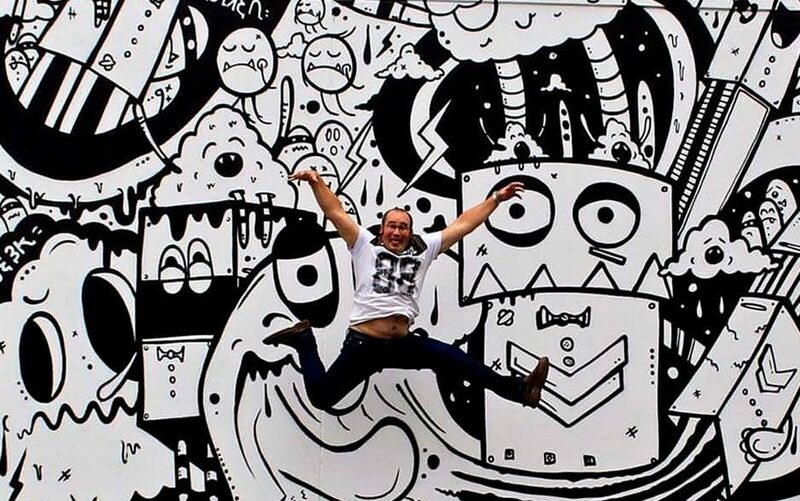 Also featured is Si Ormerod otherwise known as Cracked Ink, another former Blackburnian now based in New Zealand who creates bold cartoonish designs and Andy Faraday who will create a huge five metre wide polaroid. Other artists include Goya Torres from Mexico and UK creatives Tank Petrol and D7606. One of the street art pieces created during last years festival. Throughout the festival, co-organiser Alexandra will be exhibiting an eclectic mix of works by international artists, highlighting the variety of work produced by street artists and those influenced by street art, at Prism Gallery on Lord Street West. While fellow organiser Hayley will be painting a wall at Youthzone where she will bring to life a design based on the theme of ‘togetherness’. There was such a great energy among the community during BoW lat year, that we just had to bring it back again. Last year we had all British female artists painting and this year we’ve got people from all over the world taking part. It’s a chance to see amazing artworks up close from some of the most exciting contemporary artists. The festival which is supported by Blackburn with Darwen Council and Placeshakers and sponsored by Graham & Brown, Crown Paints and Nationwide Platforms will run from July 3-8. However, Dale Grimshaw will be painting on Lord Street West from July 10 -14. The Limited Edition II Exhibition’ at Prism Gallery will be open from Monday, July 3 to Friday, July 14 from 11am-4pm. It will host a preview show starting at 6pm where you can meet some of the artists. There will also be a street art tour of the work on Saturday, July 8 at 3pm starting at the Prism Gallery on Lord Street West. It will take around 90 minutes and include a walk to Graham & Brown where one of the artworks is being created by Alexandra Gallagher.